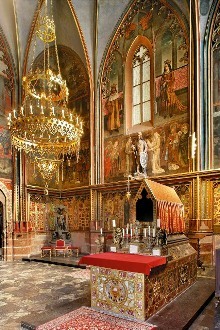 The Czech crown jewels are stored in the Coronation Chamber of St. Vitus’ Cathedral under the protection of St. Wenceslas. The chamber can be entered from St. Wenceslas’ Chapel, but its door is provided with seven locks and can only be opened if the seven key-holders are present. The crown was made on the order of Charles IV and was dedicated to St. Wenceslas. 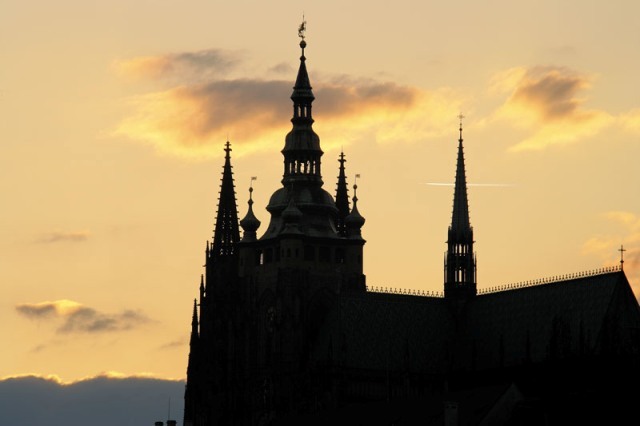 It was used for the first time in 1347 when Charles was crowned Czech King. The crown was purposely made in a rather archaic shape to follow in the footsteps of the older Přemyslid tradition and to evoke the history of Czech statehood and respect for predecessors. The crown is 19 cm wide, 19 cm high and weighs 2 358.3 grams. It is made of the purest gold (21-22 carats) and is decorated with 96 unique-quality, precious stones (sapphires, spinels, rubies, emeralds) and 20 pearls. The cross at the top of the crown is decorated with a sapphire cameo where a relief of the Crucifixion from the 13th century is placed. The scepter and the orb, exquisite examples of Renaissance goldsmith mastery, probably date back to the first half of the 16th century. They were made of very pure gold and are decorated with sapphires, spinels, and pearls. The orb is 220 millimeters in height and weighs 780 grams. It is decorated with a hammered relief depicting scenes from the bible. The scepter is 670 millimeters in length, it weighs 1013 grams, and it is decorated with intricate plant motifs. The headpiece was made in the shape of a blossom. The Czech crown jewels have their own history and legends. 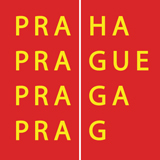 They have probably already fulfilled their mission, but will nevertheless forever remain the symbol of the Czech statehood that has lasted for more than ten centuries.